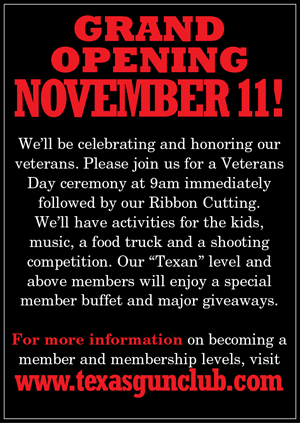 Texas Gun Club officially opens its doors on Veterans Day, and General Manager Jeff Frichette and Sales Manager Ashley Shead could not be more excited! Texas Gun Club is brought to you by founders Jason and Michaelle Short, Craig and April Davis, Dr. Shannon Orsak, Brian Orsak, Shannon and Kristin Tassin, and Mat Yelvington. At this brand new, state of the art facility, Texas Gun Club offers a fun, friendly and safe environment for shooters of all backgrounds…including a variety of classes for beginner shooters to more advanced tactical training classes. Meet the entire team and tour the facility at the Grand Opening on November 11!